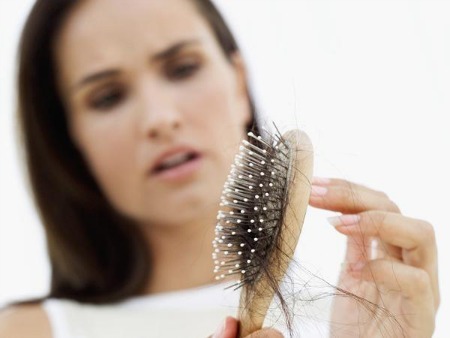 A symptom that is way more common than you would think is hair that is thinning or falling out. And it’s not just with the oldies, it’s happening to women as young as in their 20s. At first, it can come as something that you might just ignore – I mean, all girls shed, right? Well, yes, a tiny bit…but you want to be aware of any changes in hair loss as it can be a very serious sign to pay attention to! Thinning hair CAN mean a thyroid deficiency. You know why I have the word ‘can’ in caps and italics – because each individual is different. It is a common reason though. Natasha Turner, a leading Naturopath who specializes in hormone health, estimates that 1 in 13 have thyroid conditions, and if everyone were properly diagnosed, 4 in 13 would have thyroid problems. CRAZY, right? Thyroid, whether hypo or hyper, is closely linked with hair loss. Your doctor typically tests your TSH (thyroid stimulating hormone) level, but here’s the thing, the acceptable range of TSH is very wide, meaning that there can be an issue with your TSH levels that doesn’t get flagged. You could have the right amount of TSH, but if you are not converting your T4 to T3 (other thyroid hormones that they don’t typically test the levels for), then you could still experience thyroid imbalance and therefore the symptoms that follow (low energy, hair-loss, night-sweats, anxiety, to name a few). Your body produces approximately 90% of its thyroid hormone in the form of T4, but T3 is the active thyroid hormone, and it needs to be converted. If for some reason conversion isn’t happening properly, a simple test for TSH may not capture that. What can hinder proper conversion? Note: Thyroid conditions that are autoimmune related (Hashimoto’s) need to be dealt with separately. Foods that are high in iodine include any sort of sea vegetable, like kelp noodles or nori wraps. Red meat is high in zinc and iron, and brazil nuts are an amazing source of selenium!